The 21-year-old received two bookings in his first start for the club since the final game of last season. "The Leeds red card? Our fault. But at Derby? The referee's wrong. 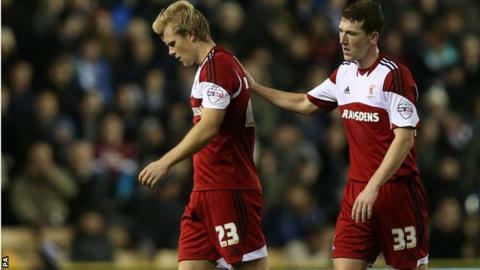 But Curtis has to learn from this," said Karanka. "He must know that when you have a yellow card, you must be calmer even though I think it was not a foul." Despite the man disadvantage, only an injury-time goal from Derby striker Conor Sammon prevented the Teessiders from taking a point at Pride Park. He failed to feature in this season's Championship under previous manager Tony Mowbray but has appeared in all three of Karanka's matches as head coach. "I liked him from day one because his attitude is very good and he fights for every ball," Karanka told BBC Tees. "That determination and fight is in the whole team as you can see by how well we did with 10 players in these away games. "Curtis is young and will make mistakes so he must improve but I want to say his red card was not our team's mistake."